Daisy Meadow: New In: Essie - Where's My Chauffeur? New In: Essie - Where's My Chauffeur? 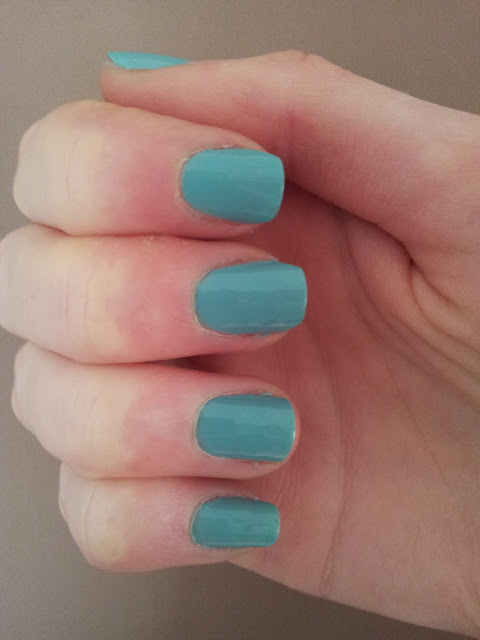 I am completely head over heals in love with this colour. Essie's Where's My Chauffeur is a gorgeous duck egg/teal colour, and just two coats gave me an amazing opaque colour. I really rate the Essie diffusion line - the polish is the perfect consistency and the brushes are extra large, making for effortless application. I finished off with their 3-Way Glaze which acts as a base coat, top coat and nail strengthener. Big thanks to Albertine for running the giveaway, her blog is lovely and you should definitely check it out here! Im such a huge Essie fan!! I love this colour!! This color is absolutely gorgeous! Girls, I need your help - I've been shortlisted! The £4 dupe for the Urban Decay Naked 2 palette? !